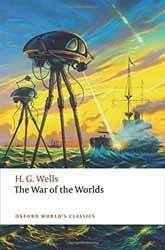 So opens one of the great books about alien invasion: H. G. Wells’s The War of the Worlds (1897. 182 pages). The basic premise was strong enough to spawn several films as well as the now infamous Orson Wells version for the radio, which led to panic when the audience thought it was a real report. The story has resounded down the years because it is fundamentally a story about hubris. Set in the dying years of the nineteenth century the British Empire was at its strongest, having subjugated large enough swaths of other peoples countries to become the greatest, in land mass, empire man had ever created. On top of this, this was a time of great technological innovation, with London, one of the largest cities of its time, sitting at the centre as a bastion of power and privilege. Wells was always interested in how things could develop and he had a keen eye for the course of possible biological annihilation, as witnessed by the narrator of The Time Machine (1895) who travels far into the future to see a bloated dying sun illuminate an alien landscape whose creatures may have been our ultimate decedents. The same book examined one possible outcome of the unfair social system and overall his writing tended to lean towards a negative outcome for the empire and for man as a species. It is not then a surprise that when his Martians invade the empire's centre, they attack London. It’s been many decades since I first read The War of the Worlds and so was interested to discover that the basic narrative held up so well. The book follows the travails of the book's narrator and his brother as they are both forced to flee from the Martian tripod death machines. I also felt that I had to eat a little humble pie on discovering that the Steven Spielberg 2005 adaptation stuck closer to the book than had George Pal’s 1953 version. The book has been printed as part of the Oxford World Classic series and I have been impressed with the time and effort that has been put into the imprints. Given that the text is over one hundred years it has dropped out of copyright, so I’m sure that you would be able to find an inferior, but free, version on-line. If you did go this route you would be missing all that the imprint has to offer. The story has a twenty-one page introduction by Darryl Jones, which places the story in its social and political context as well as exploring more general themes which are found in this and other writings by Wells. Although it is academic in its rigor, it is nonetheless a highly informative and readable piece. Each of the books in the series contains a four page chronology highlighting the important dates in Wells's life and the original publication dates. I come from London and so can picture where the Martians landed, although the landscape is far more urban than it would have been in Wells's day, but just to make sure you can have a situational picture of the events unfolding the book also contains two maps of London and the surrounding area. Aware that more than one hundred years have passed and that language is not a static medium, the text is heavily annotated to explain any, what may seem to a modern reader, unusual names or expressions. Lastly, if you want to delve deeper around the book this version contains an interesting bibliography. Overall it’s a great little edition and a welcome addition to their string of Wells reprints.